J.R.R. Tolkien: Book from his personal collection signed 2x Smith, Thomas : De recta et emendata linguae anglicae. Smith, Thomas : De recta et emendata linguae anglicae. Original brown wrappers, exterior soiled, rear panel separated, mostly unopened with page edges unseparated and uncut. viii + 61 + (6) + 44 + xxii pp. 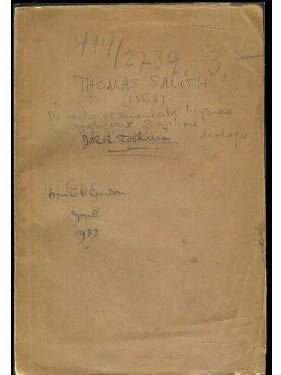 In ballpoint pen, on front wrapper: "THOMAS SMITH / (1568) / De recta et emendata linguae / anglicause scriptione dialogus." Tolkien added his calligraphic fountain pen signature, "JRR Tolkien" below this, followed by, "from E.V. Gordon. / April / 1933" adding his three-dot symbol beneath the date . The fountain pen signature and note were written over an earlier, faded signature and note in pencil, also in Tolkien’s hand: "JRR Tolkien / From EVG / 1933/." E(ric) V(alentine) Gordon was one of Tolkien’s good friends. They met when Gordon was appointed as a junior lecturer to "the language side of the English Department at Leeds" (J.R.R. Tolkien - the Authorized Biography, Humphrey Carpenter, p. 104) in 1922. "This small dark Canadian (who was unrelated to George Gordon) had been a Rhodes Scholar at Oxford, and Tolkien had tutored him during 1920" (104). Tolkien and Gordon collaborated on "a new edition of the Middle English poem Sir Gawain and the Green Knight, as there was none in print that was suitable for university students. Tolkien was to be responsible for the text and glossary while Gordon would provide the greater part of the notes" (105). The translation was published by the Clarendon Press in 1925. They also collaborated on "A Glossary of Middle English," and "helped to found the Viking Club amongst undergraduates, which besides drinking, singing and reading sagas, translated nursery rhymes into Anglo-Saxon" (The Tolkien Family Album, John and Priscilla Tolkien, p. 47). Gordon passed away from an undiagnosed kidney disorder in 1938. Original wraps are protected with an archival sleeve.